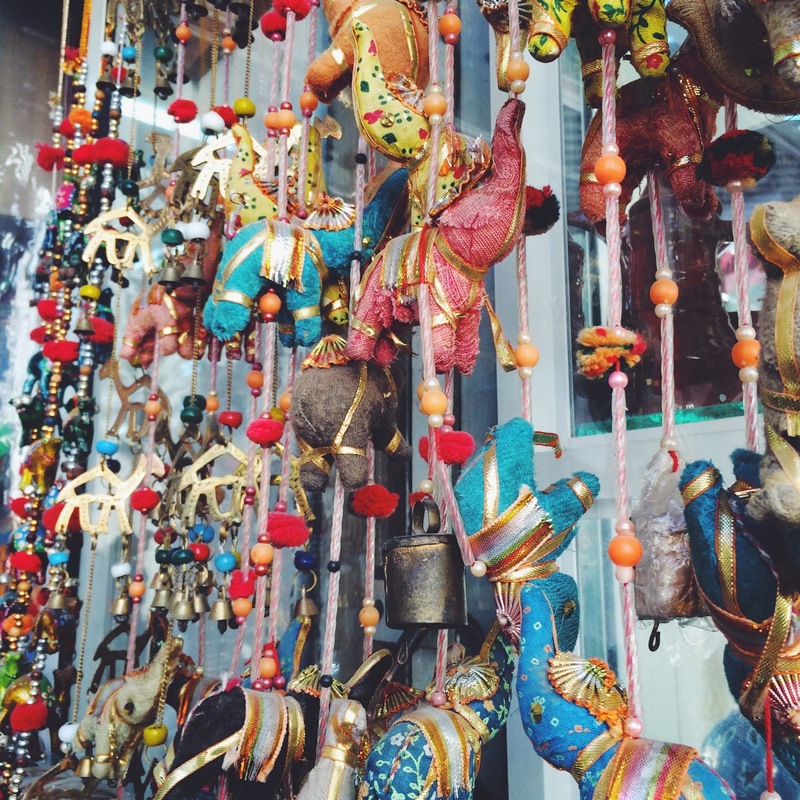 There will always be that one defining moment in all of the trips that I've taken, be it for work or leisure, and this business trip to Muscat, Oman was no different. It left me with something I will never forget, and a scar that I hope will soon fade away. Now I'm thinking of renaming this entry's title to Mishaps in Muscat. It was a glorious morning, perfect for a morning walk by the beach. It was the day before our conference, so I thought it would be nice to go for a walk because the next 3 days will not even allow me to have a decent 8 hours of sleep. I left my room at about 6:45 and made my way to the beach. It was calm and quiet, perhaps everyone's still asleep- the bed, the duvet, the pillows were all too luxurious and sleep-inducing. I walked closer to the shore to have a feel of the water. It was warm, and the waves gentle. After twenty or so minutes, I reached the part of the beach that was scattered with shells. I tried to avoid some parts by walking carefully and skipping the many rough patches but to no avail. I lost balance and the other pair of my slippers was thrown into the water. I had to grab it fast before I lose sight of it. It happened so fast everything was a blur. I fell into the water with one of my knees down, and then I felt a sharp pain. I got up and saw blood gushing down my right leg. I was trying my best not to panic, but seeing blood all over, I had to run for help. I walked past several hotel staff who didn't speak any English. I had to gesture to them that I need water to clean the cut and tissue to wipe off the blood. I knew I had to apply pressure on the cut for it to stop bleeding. Funny thing was that they didn't understand the word "tissue". There I was, with a bleeding knee, panicking while doing some charade of sorts. The other staff took out a white piece of paper from his pocket, unfolded it gently (there was money inside!!!) and handed it to me. I thanked him and took the tissue, but my brain is yelling- your wound will get infected! Ahhhh I couldn't care less. Deep inside I was laughing so hard. Then they took me to the nearest lifeguard station where I was offered two pieces of teeny tiny alcohol wipes. The guy told me to wait for the buggy that will bring me to the clinic. While waiting, I again asked for tissue and thankfully the staff went to the nearest bathroom and handed me a pile. I was at the clinic after ten minutes of waiting and was attended by a Filipino nurse, Kuya Danilo. My knee was shaking but Kuya Danilo assured me the cuts didn't need stitching. He cleaned it and helped put on a dressing. I went back to the clinic after breakfast and was attended by an Indian nurse, Blessy. She was surprised by the cuts that I had- I told her the shells basically sliced through my skin. Since it had already stopped bleeding, she placed sterile tapes to close the wounds. I was in and out of the clinic during my entire stay in Muscat- day and night. I met another Filipino nurse, Ate Jenny, who also helped me with my wound. I've never been hospitalized in my whole life so this experience scared the hell out of me. I had to at least appear "tough" because my bosses were with me. Only problem I had was my outfit for the 2-day conference. I brought several dresses but only a pair of pants. All throughout the conference, the delegates kept asking what happened to my knee. Hay. I guess no more morning walk... alone. Our flight from Muscat to Dubai then Taipei was almost nine hours in total. I was worried that my wound may not be able to breathe and get infected. When I arrived home, I was so tired that I fell asleep after unpacking my stuff. I woke up the next day to Auntie Josie's message. Auntie Josie is the cousin of my aunt's friend; she's a doctor here in Taipei. She brought some stuff the night before to clean my wound and left it with our building's security guard. How very thoughtful of her. She was the first person I texted when the incident happened (not my parents because they'll panic). She dropped by my place last Sunday to teach me how to clean the cuts and put the bandage on. The wound is slowly healing. The scabs are starting to fall off but it is still very painful. 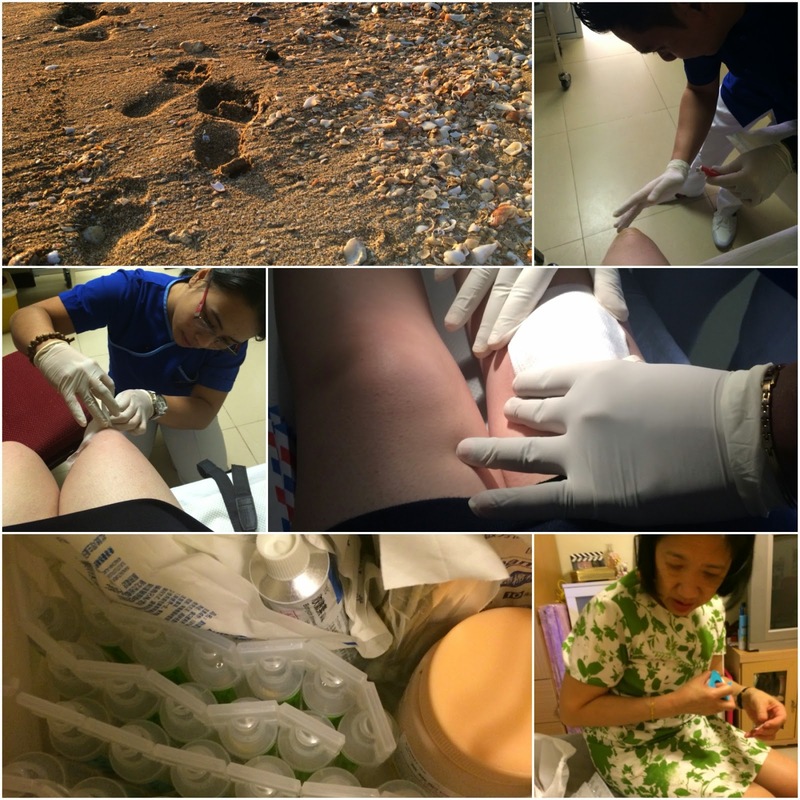 The scars will remind me of this memory in Muscat- the loving and wonderful nurses of Shangri-La who did not bill me for their services. I owe them a lot, not only money, but a debt of gratitude. Everyday that I'm in the clinic, I hear their stories that are quite similar to mine. We're all OFWs living far from home and from our families, but we're still happily committed to our jobs. Thank you, Kuya Danilo (hope you win more singing contests! hehe! ), Ate Jenny and Blessy for taking care of me! I will always remember you in my prayers. I still got to enjoy Muscat despite my injury. My bosses told us to join the free optional tour to the other town called Nizwa where we visited the Nizwa Fort (a humongous castle built in the 1650s), and a local market which they refer to as "souq". Hope you enjoy the photos! The milk tea I had last Saturday kept me up all night. I was trying to be productive by drafting two invitation letters and a sample itinerary for my pending visa application to be lodged next month. I finished the documents at 2:00am and I still cant get myself to bed. I opened my journal and back-read my entries. I was overjoyed while flipping through the pages where I pasted boarding passes, train and park tickets and recalled every memory that came with those travels. I also put 'mental check marks' on the items that have been accomplished. 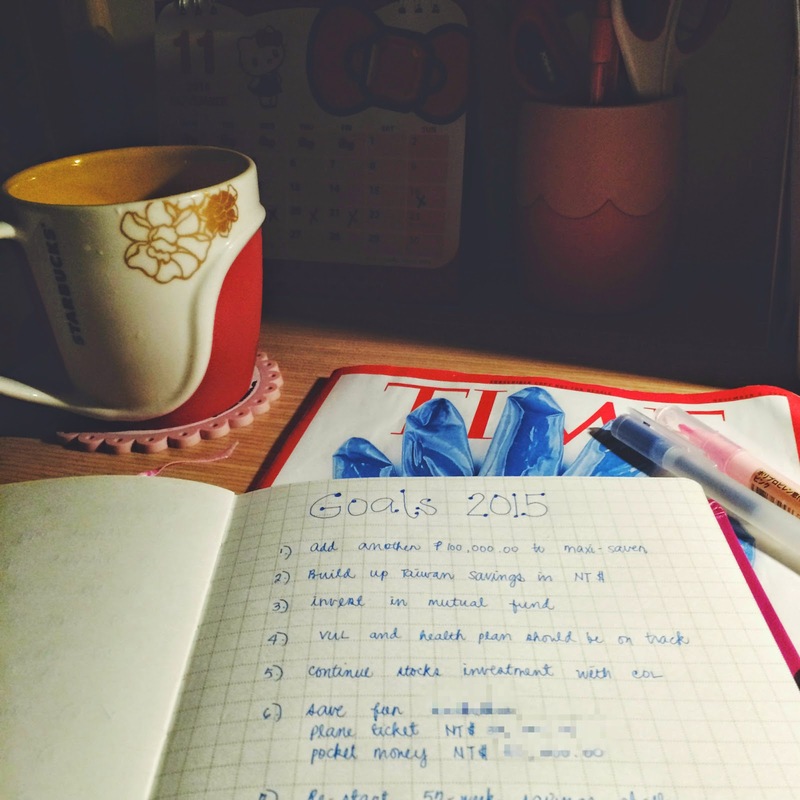 And so I went to the back page of the journal and started jotting down my 2015 goals. With all the positive vibes (probably infused in the milk tea), I was smiling from ear to ear, hoping against hope that I get to tick them one by one again by the end of next year. It was 3:00am when I finished writing, I turned off my desk lamp and tried getting some sleep. I don't know how much caffeine that milk tea had, but I was still tossing and turning in bed by 3:30. Since I cant make myself fall asleep, I tried recalling some events from last week that made me really happy and started uttering prayers of thanks for every single thing/person/event that painted a smile on my face (including our building's reliable security personnel who helped carry my 8-kg Ikea box from the cab to the elevator). It was indeed a great birthday month for me, ending it ever so specially with Monica's visit. My bestfriend Monica was in town with her whole family. Originally it was only her mom, dad and youngest sister joining the Lion's Club Tour to Taipei, but Monica was able to clear her schedule after finishing her pre-residency. I was so delighted when she said she won't be staying at the hotel with her parents and would want to see my new place. She stayed with me for 3 nights- the longest time we've spent together since her last Taipei visit with Monnette in 2011. Unlike Monnette, Monica is not a nature-person. You can't bring her hiking or go see the forests and mountains. She'd rather sit in a coffee shop and read her Med books. So after doing the usual Taipei stuff- night market, milk tea and eating shabu-shabu, I took her to this nice little coffee shop called Topo in Tienmu. I knew she'll like it there, and I was right. We like taking things slow now compared before- cup of latte and tea, slabs of bacon for brunch, and then some molten chocolate cake. We no longer shop till we drop. We've become these mature individuals who spend time and money wisely. Gaaaad signs of aging (and maturity) perhaps? I'm grateful that I was able to spend time with both Monica (in Taipei) and Monnette (in Korea). With Monica, I look forward to ending the day with long chats in bed- talking nonstop about our personal lives, our many plans for the future. With Monnette, I love hanging out with her ever since. She's super patient, relaxed, never in a hurry. I'm always inspired with how good her heart is. I miss them now that I'm writing this entry. On a side note, Monica and I dropped by Ikea to have a look at some household stuff (again, signs of aging hahaha). I fell in love with a certain pink desk chair that I cant get it off my mind. So last Friday, I gave in and bought it on a whim, together with the pink LED desk lamp. I was worried about two things: (1) carrying the 8-kg box where they packed the chair (2) assembling it correctly. My mom even sent a Viber message saying I need to make sure all bolts and nuts are properly screwed. I will be leaving for work this coming Sunday, and will be away for 6 days. We're traveling to the Middle East this time for another annual gathering, please do wish us luck and a safe journey :) Have a great November, y'all!